Sweepstakes: The Cheesecake Factory Joy to the World Giveaway (Win a Trip!)!!! 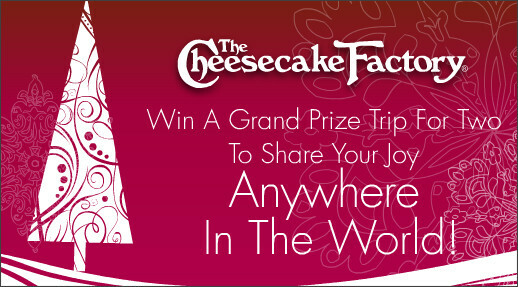 The Cheesecake Factory has a new sweepstakes called Joy to the World! You can WIN a Trip For 2 to anywhere! You can also visit The Cheesecake Factory Facebook page where you can upload pictures to WIN instant prizes (plus you'll be entered to win the trip!). You could win FREE slices of cheesecake, $100 e-gift cards, and even cheesecake for a year! Yummy!